What does the investigation tell us about the Warmington landscape? The earliest evidence from the work done so far at the National Herb Centre dates to about 6,000-4,000BC, when mesolithic hunter-gatherers used the high ground above Warmington as part of their territory. We have found part of their flint tool kits, used for making barbs for arrows and scrapers for cleaning skins. There is no evidence that they were living on the ridge, and it is probable that they exploited the game and other woodland resources of the area, possibly based on seasonally occupied camps. Some of the flintwork collected in the recent fieldwalking dates to the time of the first farmers, around 4,000 to 2,000BC, and although there is not a large amount of such neolithic flintwork it does occur over much of the area. This tells us that early farmers were probably working this land, which when cleared of timber is light and well drained. Evidence from elsewhere shows that they were well organised (able to construct monuments such as the Rollright Stones) and were farming the light well-drained soils on the Cotswolds. and this is probably also the case at Warmington. The agricultural use of the land probably continued throughout the bronze age (2,000 BC to 700 BC) and the iron age (700 BC to 45 AD). The iron age fort at Nadbury on Camp Lane is only a kilometre away and must have included Warmington in its hinterland. The fieldwork so far has shown that the high ground above Warmington was being farmed in the Roman period (AD45 – AD410). Small fields and access tracks marked by ditches can be seen on the geophysical surveys undertaken by David Sabin in 2007. The farmers in the early Roman period probably used the same field layout as earlier iron age farmers, as we found pieces of hand made pottery mixed with the Roman finds. 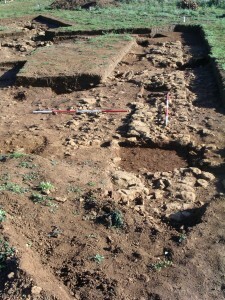 The excavation revealed the foundations of a large Roman stone building and a yard, together with the remains of an earlier stone building, dismantled in Roman times, probably to recycle its materials. They are unlikely to have been domestic buildings, and a barn and yard or similar arrangement is more probable. The west wall of the Roman barn. The small section in the foreground has been excavated to show the lack of any surviving foundations. What happened in the early medieval period (AD410 – 1050) following the Romans is difficult to trace. Although some Saxon objects have been recovered from the area, there is no consistent evidence for farming or habitation on the National Herb Centre fields. By the later medieval period we can assume that the Roman fields had been swept away by the reorganisation of the manor’s lands into several huge fields divided into strips shared out amongst the villagers. Hints of ploughed-out ridge and furrow, typical of midlands open field systems, have been found on the site. Small pieces of medieval and Tudor pottery found in the excavations and in fieldwalking also show that the area was manured during the period. Other finds showing the later use of the area include clay tobacco pipes, pottery, a medieval spur, coins and sundry farming bits and pieces such as horse and ox shoes. What is the significance of these discoveries? 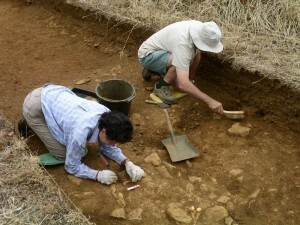 Of great interest to archaeologists and historians is how the rural economy changed between the iron age (700BC to AD45) and the Roman period (AD45 – AD410). Most people in both periods lived the countryside, and made a living off the land, and although we know a bit about how the style of buildings changed — from round to rectangular — there was also a change in the diet and probably a change in the landscape. 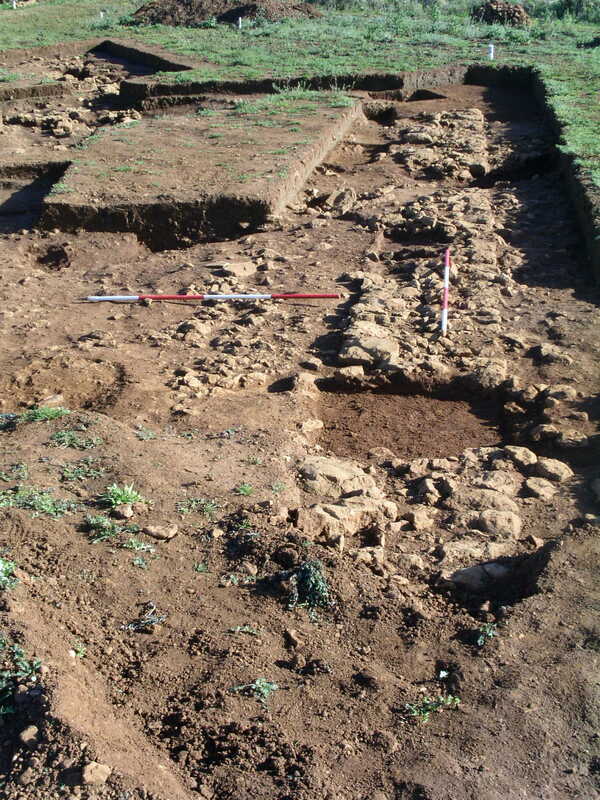 It is most likely that our large Roman building and its yard were used for storing grain, and that suggests that for the first time large amounts of cereals were being produced and stored here. 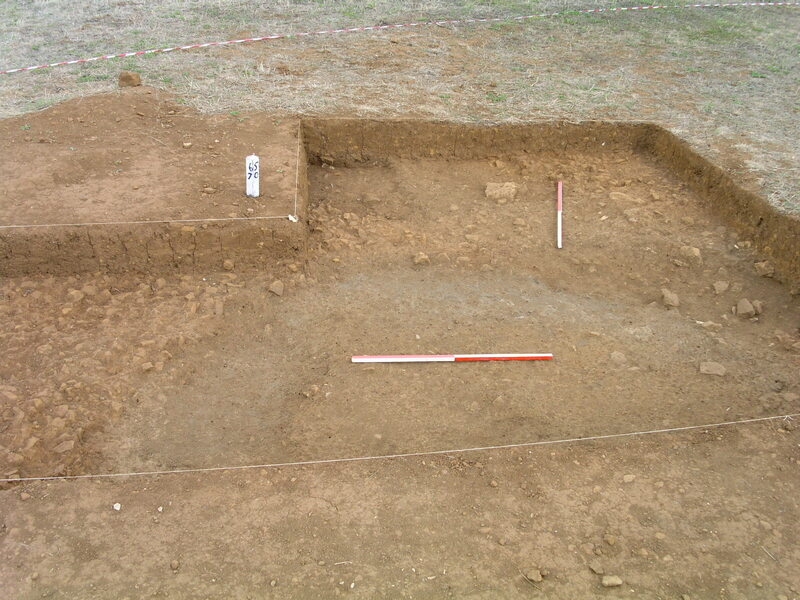 Previously, iron age grain storage was in pits or in small stores above ground, represented in the archaeological record by “four-posters” — the remains of the corner posts of these stores — and these are typically quite small structures. Although some hillforts and large settlements have produced many examples of them, they are not usually found in large numbers at the producer sites. The suggestion here is that with the Roman administration came the need to feed a larger proportion of essentially non-productive people — soldiers, administrators, politicians, villa owners, and the entourages which accompanied such high status individuals — and so the rural economy was required to become better at providing a surplus for this part of the population. The theory is that grain is more efficient at providing sustainance and is more easily transported and quantified (for taxation purposes) than livestock, so the earlier mixed farming of the iron age was transformed into a more cereals-based economy. Such a change has implications for how the landscape looked. 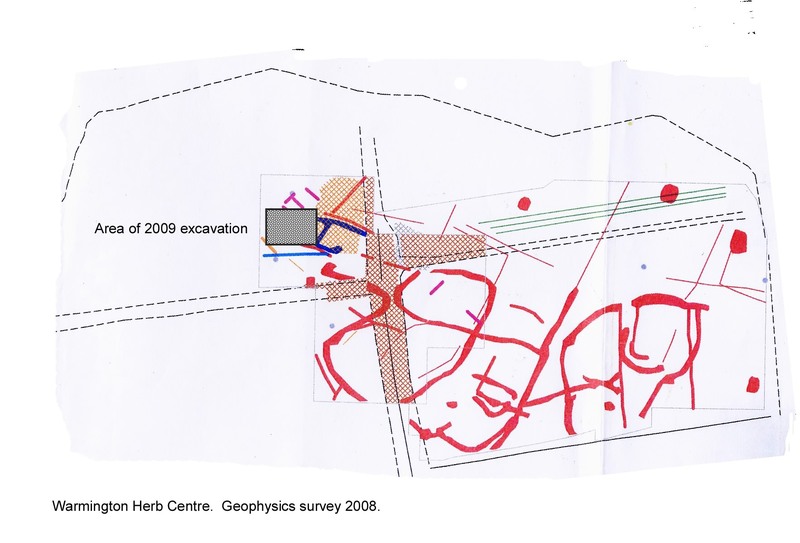 At the Warmington site it may be reflected in the change of orientation of the system of small fields detected in David Sabin’s 2007 geophysical surveys, to the later well-built barn and its yard on a different alignment. Were the small enclosures, appropriate for mixed stock and cereal farming, converted to larger fields, better suited to ploughing? The purpose of the 2011 season is to explore this research aim. In 2008 a small section was cut across the a ditch, the only part of the complex field system which projects into the excavation area. This showed a complicated sequence of cuts and recuts, some at least of which were backfilled in the Roman period. 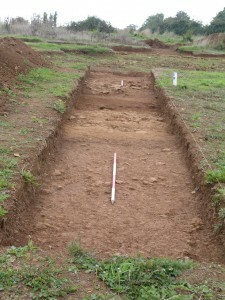 The terminal of a large ditch (1 metre measure) showing as grey fill. In 2011 we are excavating the terminal of this ditch, to establish the sequence of cuts, and if possible to date them more precisely, and, more importantly, to obtain environmental samples to find out is there is evidence of a change in the farming regime at the site to support the theory of landscape and economic change in the early Roman period.